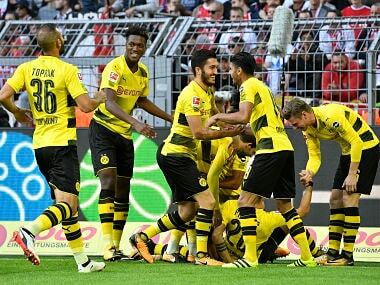 Berlin: Pierre-Emerick Aubameyang scored twice in a minute as Borussia Dortmund went back atop of the Bundesliga on Sunday after a 5-0 hammering of Cologne, who fumed over a controversial goal. After losing at Tottenham Hotspur in midweek in the Champions League, Dortmund needed just 111 seconds to take the lead at home. Winger Andrey Yarmolenko fired in a cross which was headed home by fellow new-signing Maximilian Philipp. On the stroke of half-time, Cologne goalkeeper Timo Horn fumbled a cross and defender Sokratis Papastathopoulos tapped home the loose ball to make it 2-0 at the break. There were furious protests from Cologne, as replays showed the whistle went before the goal was scored, but it stood even after the video assistant referee (VAR) checked. "We will not sign off on the match log and will protest immediately," said Cologne's manager Joerg Schmadtke. "That was clearly a wrong decision which decided the game." Aubameyang slotted home a penalty after the VAR spotted a hand-ball on 59 minutes and just 58 seconds later the Gabon striker bagged his second from a Lukasz Piszczek's pass. Aubameyang, last season's top scorer in the Bundesliga, now has four goals in as many league games, one behind Bayern Munich's Robert Lewandowski. Philipp then grabbed his second of the game with a deft chip to cap three Dortmund goals in 10 minutes. In the dying stages, Dortmund coach Peter Bosz gave a Bundesliga debut to Swedish wunderkind Alexander Isak, who turns 18 on Thursday. Cologne's strong protests over the second goal went down badly in the Dortmund camp. "The only thing which is clear is that Cologne can't take losing," said Borussia's CEO Hans-Joachim Watzke. "And if you can't take losing, then you turn to bad methods." "If you do so after losing 5-0, then hats off," he added sarcastically. 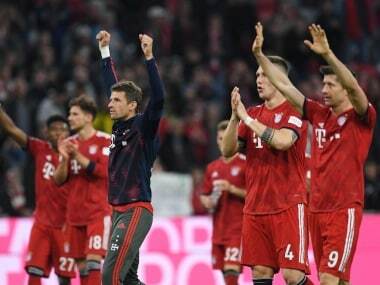 The win leaves Borussia top on goal difference from second-placed Hanover 96 with defending champions Bayern Munich third and just a point behind after Saturday's 4-0 win at home to Mainz when Lewandowski scored twice. Cologne are bottom with four straight defeats while Dortmund have yet to concede a league goal. 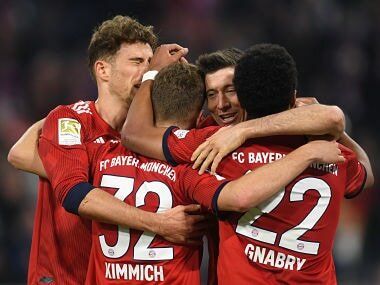 Hanover were top of the table for 48 hours — their first time in first place since 1969 — after Friday's 2-0 win at Hamburg thanks to goals by Martin Harnik and Togo winger Ihlas Bebou. 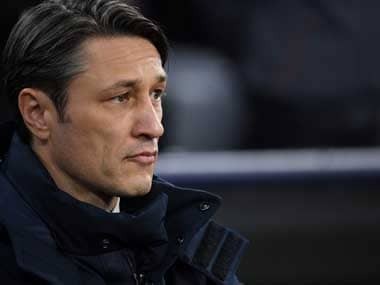 Earlier on Sunday, Hoffenheim missed the chance to go top when they were held to a 1-1 draw at home to Hertha Berlin as Sandro Wagner's early goal was cancelled out by Alexander Esswein's second-half equaliser. The result leaves Hoffenheim fourth in the table with Hertha down to 11th and keeps Hanover, who won promotion back to the Bundesliga last season, as unlikely league leaders. Also on Sunday, Germany striker Kevin Volland netted twice as Bayer Leverkusen left the relegation places to go 12th with a 4-0 rout of Freiburg. After taking just a point from their first three league games, Leverkusen flew out of the traps at the BayArena as Volland netted either side of a stunning strike from Chile midfielder Charles Aranguiz. Volland opened the scoring with a superb strike from outside the area, but not to be outdone, Aranguiz showed superb technique by volleying home, then Volland tapped home Lars Bender's cross to make it 3-0 at the break. Freiburg coach Christian Streich reacted for the second-half by bringing on England Under-20 winger Ryan Kent, who went close with a late shot, but the result left the club in the bottom three. The 25-year-old Volland looked to have wrapped up his hat-trick on 70 minutes, but the video assistant referee disallowed the goal due to a foul in the build-up before Julian Brandt scored Leverkusen's fourth from a quickly taken free-kick.